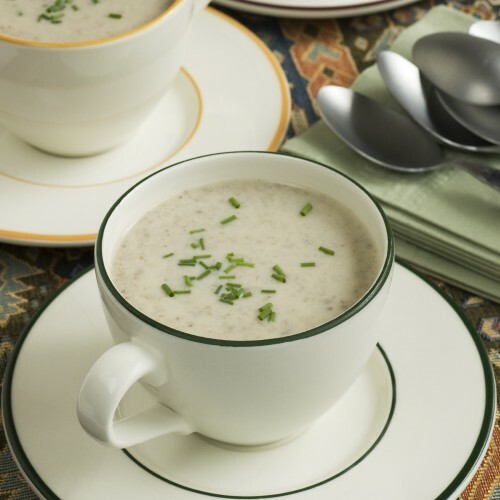 This delectable soup is as easy as it is delicious — a mushroom-lovers delight and relatively low fat. Savor it as a walk-around appetizer in mugs or as a sit-down first course. Conveniently, it can be prepared a day or two in advance and refrigerated. Warm it up on the stovetop or microwave just prior to serving. Brown-capped crimini mushrooms lend an earthy flavor and inviting, warm color. These mushrooms are also called baby bellas, or sometimes portabellinis, because they are young, smaller versions of more mature portabella mushrooms. See more information below recipe. Wipe mushroom caps with a damp cloth. Trim stems and coarsely chop mushrooms. In a 6-quart pot, melt butter with onion. Add mushrooms and sherry cooking wine. Cook over high heat, stirring occasionally, 8-10 minutes or until most, but not all, of the sherry is absorbed. Sprinkle flour over mushrooms; stir in milk, broth, soy sauce and sage. Bring to a boil, then immediately reduce heat. Simmer gently 10 minutes, stirring occasionally. Remove soup from heat. Use an immersion blender to puree soup. Or pour into a blender in batches; blend until smooth and return to pot to keep warm. Season with salt and pepper to taste. Serve garnished with chives or parsley, if desired. – Use cream sherry, if desired. Add ½ teaspoon salt to the soup; reduced-sodium broth is optional. – Use vegetable broth if you prefer. I like the Kitchen Basics brand in a box, Unsalted Vegetable Cooking Stock. Crimini Mushrooms are grown and harvested in the same manner as the white mushroom. The reason they have a darker color and slightly denser texture is that they come from a different strain of spores. Portabella Mushrooms are also grown like white mushrooms. Actually, the Portabella is a mature Crimini. It’s usually three to seven days older than the Crimini when harvested. As a result, Portabellas develop much larger caps-ranging up to six inches in diameter. Sherry and mushrooms is a perfect marriage! And your photo is just lovely. I makes me want to jump right into the photo and have that soup. A spa treatment!! Just what I need after the holidays and all the dry air here in the mountains!